Christopher Mies holds four of the six best times for practice five, including the most important one – the last one. Mies set the fastest time of the session in the final moments before a red flag with nine minutes to go saw the session declared – topping the sheets with a 2m 03.500s lap to take over from Warren Luff and the #11 Objective Racing McLaren 605s which held the spot for the half hour proceeding. Leading the classes were the #32 Lago JBS Australia Lago Racing Lamborghini R-EX (Rydges Bathurst GT3 AM), the #11 (BRM Watches GT3 Pro-AM), the #75 (Liqui-Moly GT3 Pro-Pro), the #4 Grove Hire Porsche 911 (myPlates Class B GT3), the #55 RA Motorsports Ginetta G55 (Avis Class C) and the #65 Daytona Sportscars Dodge Viper Coupe (Racer Industries Class I). It was a challenging session for some of the field. Just seven minutes in, the #62 R Motorsport Aston Martin V8 Vantage of Jan Struve would suffer a large incident near the end of Audi Mountain Straight, incurring large damage after contact with the wall. At the time of the red flag flying for the recovery of #62, Mies was on top of the sheets with a 2m 06.441s. Green flag running resumed nine minutes later at 8.16am and just minutes after the resumption, Mies bettered his time to 2m 04.525s before again improving on the very next lap to 2m 04.310s. It would stand for only a moment however, with Warren Luff in the #11 Objective Racing McLaren 605s following up with the first ‘three’ for the session – a 2m 03.864s set with 40 minutes remaining. Luff would hold the top spot until what would be the last minutes of the session, when Mies set a 2m 03.500s lap in the #75 at 8.51am, a few minutes before the session was declared following the flying of a red flag flew for the #23 Nissan Motorsport Nissan GT-R Nismo GT3. The entry, piloted by Katsumasa Chiyo, plucked the right wheel off at the right hander between the Coates Hire Essess and the Sparesbox Dipper with eight minutes to go, bringing out the red flag and see the session declared. It wasn’t all bad news for the Nissan Motorsport outfit however. Earlier in the session, the #24 Nissan Motorsport GT-R Nismo GT3 made its return to the track after yesterday’s battle with the famous Mount Panorama ‘Metal Grate’ following an all-night effort from the dedicated Nissan crew. Joining the #24 in making a comeback today was the #37 Darrell Lea Keltic Racing McLaren 650s. The McLaren had suffered a oil leak after a rouge bolt in the engine was flicked up and punched a hole in the rocker cover. Earlier, the team had thought an overnigth engine replacement would be necessary, but was instead able to avoid this and rectify the issue overnight. Coming under the attention of race control during the session were the #29 Trofeo Motorsport Lamborghini Hurricaine GT3 and the #69 RA Motorsports Ginetta G55, with each shown bad sportsmanship flags during the session for driver conduct. Also having issues in this session was the #95 MARC Cars Australia Focus V8 which was forced to pit lane with a leak in the rear right, while the #48 Interlloy KTM X-Bow limped home to pit lane at the mid-point for attention. 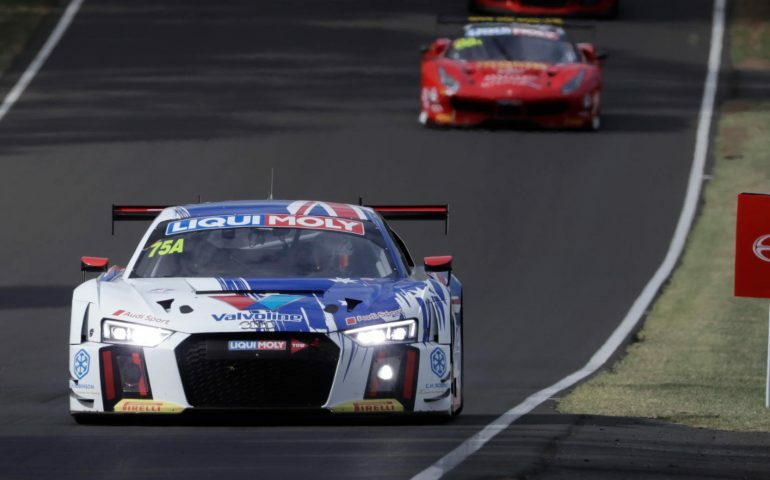 The Liqui-Moly Bathurst 12 Hour action continues here at Mount Panorama, with qualifying set to kick off at 10.40am. Tickets remain on sale via ticketek and are also available at the gate this weekend.